According to Wim Van Gerven, CEO Business Division North, ArcelorMittal Europe – Flat Products, it all comes down to innovation, improvement, and good people. His job is to make our business both economically and environmentally sustainable. But how can we manage what could be seen as competing interests? Architecture, Building and Construction all in one website, it is as simple as ABC… Constructalia, one of the world’s leading steel reference sites for architects, engineers, and building owners has undergone a complete transformation and is now available via a new URL: constructalia.arcelormittal.com. ArcelorMittal Europe – Flat Products is the first steelmaker in the world to provide BIM details for our extensive portfolio of aesthetic products for construction. Building information modelling (BIM) gives everyone involved in the construction process a digital prototype of the building before it is built. Aluzinc® is an eye-catching metallic coated steel produced by our mill in Dudelange (Luxembourg). The unique spangled appearance of Aluzinc® gives buildings an exceptional and contemporary light-reflecting finish which will add beauty and elegance to any built environment. Modern life would be almost impossible without the large-scale warehouse and distribution centres which provide us with everything from food to spare parts. Our Advanced high strength steel grades are helping distribution centre owners to develop lightweight, robust, and durable racking systems which will keep us supplied with our daily necessities well into the future. Over the past decade, the market for aerosol cans has grown by average of around seven percent annually. 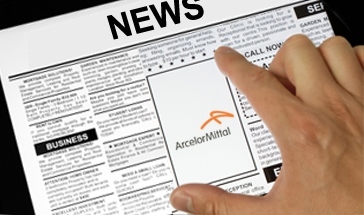 During the Aerosol and Dispensing Forum (ADF), ArcelorMittal showcased its simulation tools which can help the industry on at least 4 different levels. On 2 February 2017, ArcelorMittal Europe – Flat Products unveiled the first Jet Vapor Deposition (JVD) line in the world. This breakthrough technology will be used to coat ArcelorMittal’s automotive steels for cold forming such as Dual Phase, Trip, MartINsite® and Fortiform®. ArcelorMittal received the Built In Quality supplier award from Toyota Europe in recognition of ArcelorMittal’s impressive quality performance. In addition, Toyota recognized ArcelorMittal for the efficiency and robustness of our Built In Quality project for galvannealed steel deliveries.